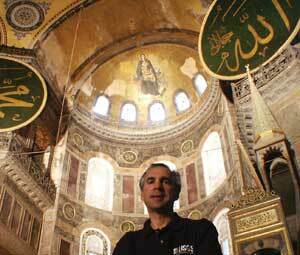 Geophysicist Ross Stein, who has studied earthquakes in Turkey (and elsewhere) for many years, sits under the dome of Ayasofya (Hagia Sophia). Twelve large earthquakes have shaken the building since its completion in 537 A.D., making it a 1,500-year-old seismometer. Like all who study earthquakes, Ross Stein doesn’t want to just understand them — he wants to anticipate them. Stein, a geophysicist at the U.S. Geological Survey in Menlo Park, Calif., has investigated earthquakes from many angles: He is interested not only in where and when a quake might occur, but also in how earthquakes interact to inhibit or trigger each other, and in how they can dramatically reshape Earth’s crust. Most recently, Stein has been working with seismologist Domenico Giardini of the Swiss Seismological Service in Zurich to convince scientists, governments and insurance companies alike of the need to create an open model for earthquake risks that encompasses data from the entire globe. With that additional data, he says, such a model — currently dubbed GeoRisk — could help scientists create earthquake forecasts that may someday be as accurate as predicting the weather. Stein sat down with Geotimes staff writer Carolyn Gramling to talk more about GeoRisk, natural hazards documentaries, and some seismologists’ favorite earthquake. Q: What drew you to study earthquakes — were they always your favorite subject? RS: [As a child], I went to summer camp at Plantation, a farm along the San Andreas Fault. There is a redwood tree there that straddles the fault. The tree was ripped in two by the great 1906 earthquake, with both sides still living 70 years later. As an undergraduate [at Brown University], I went back to the camp to do a field project and saw it with a geologist’s eyes. That was wonderful. At the time I was very interested in both earthquakes and paleontology, particularly pterodactyl flight, and I was also excited by lunar geology. But I ended up with earthquakes, because I wanted to do something where I could help people. I think earthquakes are one of the most important, fascinating unsolved problems in earth science — why they occur, what triggers them, what stops them. And they intersect societal issues, because they’re so destructive, and the toll they are taking keeps rising. Q: Tell me about GeoRisk. You are currently pitching it to a range of possible funders? RS: Yes. And I don’t think we’re alone in recognizing the need for an open, online global earthquake risk model. It’s truly frightening that almost all research and money goes to the developed world, and almost all deaths and consequences happen in the undeveloped world. There’s also a scientific imperative: If we only forecast earthquake hazards in the developed world, we’re doing it in too few areas to be able to test if it’s working at all. We’ll never know if we’re doing better than chance, because there aren’t enough earthquakes that occur. One of the ironies for the U.S. public, therefore, is that to get better earthquake forecasting for California, for example, we need such a global model. Q: What’s the benefit to insurance companies? RS: The large global reinsurance companies are placing huge financial bets on the global occurrence of earthquakes. So they need to be able to assess the relative risk. They are natural allies of an open global model — but we are asking them to help pay for something that will be shared with their competitors. So what we’re trying to show is that a rising tide will lift all boats. Q: You’ve been involved in a number of hazard documentaries [including NOVA’s “Killer Quake” and National Geographic’s IMAX movie “Forces of Nature”]. What do you most want to convey to the public about earthquakes? RS: Most important is to tell the public what we do know and what we don’t know — and I promise you, the latter is the hard one. We live in an age where lots of people feel they are not being told the truth by their government, or think scientists have an agenda — to win more money for our research or to come off as know-it-alls. And what the public wants to know we can’t always provide them. In the earthquake business, we’re always dealing with chance. But what I have also learned is that if we explain things in terms people understand, they’re so appreciative. It’s also important to express our enthusiasm, our joy in discovery and in what we’re doing. And although it’s easy to convey that intellectual excitement, we can also look like Dr. Strangelove if we seem to be taking too much pleasure in the occurrence of a large earthquake. Q: I read an article in which you called the 1992 Landers earthquake in California the “Velveteen Rabbit” of earthquake science, because it’s been loved and fussed over so much. That could sound odd. RS: Yes (laughs). But Landers was a big earthquake that hardly hurt anybody. And it produced a wealth of data, and offered opportunities to understand phenomena we hadn’t been able to study before. So we felt a bit entitled to our glee.